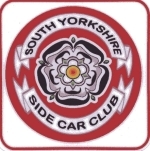 The South Yorkshire Sidecar Club has members from Yorkshire, Derbyshire, Lincolnshire. and Nottinghamshire Besides all year round sidecar related activities, it has club nights on the first and third Sundays of each month from 8 pm. Members' activitities include day runs, sidecar rallies, camping weekends, and holiday trips throughout the UK and Europe. New and established members benefit from many years of experience within the club in all manner of sidecar matters. This includes aspects of sidecar engineering, and generally how to get the most out of sidecar ownership.